What are PaperCut Cloud Services? PaperCut Cloud Services take away your worry about managing the system performance of local infrastructure; the heavy lifting of document processing is done in the cloud.This approach also allows PaperCut Software to rapidly deliver features to your door without any down time at your end. You don't need to upgrade your PaperCut MF installation to get new features; they are automatically deployed to PaperCut Cloud Service and available to you instantly. To use PaperCut Cloud Services, you must have active Premium Upgrade Assurance (PUA). Is an additional license required to use the PaperCut Cloud services? No, Scan to Cloud Storage and OCR are free as long as your Premium Upgrade Assurance (PUA) is current. How reliable are the PaperCut Cloud Services? The PaperCut Cloud Services run on the Google Cloud Platform, which is highly reliable. It’s the same infrastructure Google uses for its own products such as Search, Drive, and Maps. Google states that the "Service will provide a Monthly Uptime Percentage to Customer of at least 99.95%”. Where are the PaperCut Cloud Services located? I don’t want my documents to leave the EU or EU-US Privacy Shield. Currently the PaperCut Cloud Services run only in a US Google Cloud Platform. But we know customers in different regions want a more localized service. We are planning on expanding to use a European datacenter by release 19.0, and are also investigating more services around the world so stay tuned. Once this is in place, a PaperCut MF SysAdmin will have the ability to configure the region they want their documents to travel through. Are scan job details retained by PaperCut Software? In accordance with the General Data Protection Regulation (GDPR), you can configure PaperCut MF to redact user details. For more information about GDPR, see General Data Protection Regulation (GDPR). Will the scanned documents be routed through other countries during transit? Scan to Cloud Storage and text-searchable document (OCR) jobs are routed through a data center in the US, but are definitely not retained by PaperCut Software. How secure is my scan job when it is in transit through the PaperCut Cloud Services? All scan jobs and data are encrypted with signed certificates and transmitted over HTTPS following industry security best practices. If a text-searchable or Scan to Cloud Storage scan fails to reach its destination, will the user be notified? If a scan fails to reach the PaperCut MF Cloud Services, PaperCut MF will retry sending it. If after the configured retry period (default approximately 10 minutes for Scan to Cloud Storage and 1.5 hrs for text-searchable documents), the scan still cannot be delivered, the user will receive an email letting them know that it has failed. If a scan reaches PaperCut MF Cloud Services, but cannot be delivered to its destination, PaperCut MF continues to try to send it for 24hrs. If after 24hrs, the scan cannot be uploaded, the user will receive an email indicating that the scan has failed. cannot be delivered within 24hrs. Which cloud storage providers are supported? Google Drive, OneDrive (Personal and Business), Dropbox (Personal and Business), and Box. We are continually adding connectors so check back again soon if your storage provider is not currently supported. How does my document get from the MFD to my cloud storage provider? 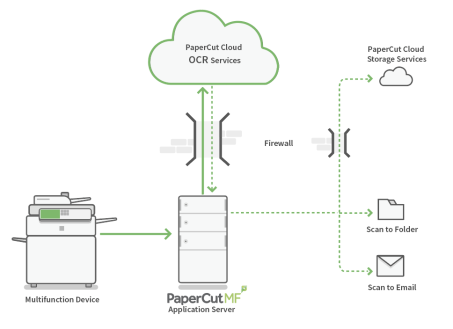 When a user scans a document, it is sent from the MFD to the PaperCut MF Application ServerAn Application Server is the primary server program responsible for providing the PaperCut user interface, storing data, and providing services to users. PaperCut uses the Application Server to manage user and account information, manage printers, calculate print costs, provide a web browser interface to administrators and end users, and much more., where it is temporarily held before being uploaded to the PaperCut Cloud Storage Service. In most cases, the document will simply pass straight through the Application Server to the PaperCut Cloud Storage Service. However, if there are connection issues, the document will be held for approximately 10 mins (default) while the Application Server retries the transmission, before being securely deleted. The first time a user attempts to scan to a cloud storage destination, the document will be held for up to 24hrs by the PaperCut Cloud Storage Service until the user authorizes PaperCut MF to upload to their chosen cloud storage provider. The user will receive an email prompting them to perform this authorization. This is a one-off step—subsequent scans do not require re-authorization. Once the user has granted PaperCut MF permission to upload to the cloud storage provider, the job is delivered. If it cannot be delivered in 24hrs, it is securely deleted. Why is PaperCut using a cloud service for Scan to Cloud Storage? 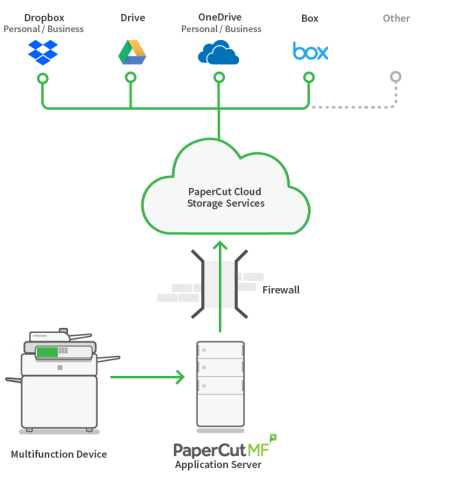 PaperCut MF uses a cloud service to deliver Scan to Cloud Storage as this allows us to provide the breakthrough one-click Scan to Cloud Storage solution. Our cloud storage service manages the authentication process required by most cloud storage providers through a public facing address. PaperCut Cloud Services also takes away your worry about managing the system performance of local infrastructure; the heavy lifting of document processing is done in the cloud. Providing the Scan to Cloud Storage functionality through a cloud service means you will have access to updates and new cloud storage connectors sooner. You don’t need to wait for the next PaperCut MF release, and then upgrade to take advantage of the updates - they will happen automatically behind the scenes. Do users need to authorize every scan job? Absolutely not! PaperCut Software believes in making life easier for you. The first time a user does a scan, they will do a one-off authorization of PaperCut MF to upload files. After that, scanned files are automatically uploaded. Can users select a cloud storage folder location for their scanned files? We’ve had a number of people asking about this and it’s on our roadmap. Does Scan to Cloud Storage provide the ability to add metadata to scanned documents? At this point in time, Scan to Cloud Storage documents cannot store metadata. Where are the scanned files stored during transmission? Scanned documents are sent to the cloud storage provider via the PaperCut MF Application Server and PaperCut Cloud Storage Services. In most cases, the document will simply pass through the Application Server to the PaperCut Cloud Services. However, if there are connection issues, the document will be held for no more than approximately 10 mins (default) while the Application Server retries the transmission, before being securely deleted. cannot be uploaded within 24hrs. If this occurs, the file is securely deleted and cannot be recovered. If a user has not yet authorized PaperCut MF to upload files to their cloud storage provider, the scanned files are stored in an encrypted format for up to 24hrs in the PaperCut MF Cloud Storage Service until the authorization is complete. The files are then transmitted to the selected cloud storage provider. If a user does not authorize PaperCut MF within 24hrs, the file is securely deleted. Are any of my cloud storage credentials retained by PaperCut MF? No, your cloud storage credentials are not stored in PaperCut MF. Instead, the PaperCut Cloud Storage Service stores the access token and refresh token provided by the storage provider during the authentication (OAuth) process. Users can revoke these at any time via their storage provider. If someone leaves the organization and is removed from both PaperCut MF and the user directory, are they also removed from the cloud service? No. PaperCut MF does not add or remove storage provider accounts. Users can manage this on their own by removing the PaperCut MF app from their personal cloud storage account. How is my scanned document converted to a text-searchable document from the MFD? When a user scans a document, it is sent from the MFD to the PaperCut MF Application Server, where it is temporarily held before being uploaded to the PaperCut Cloud OCR Service for conversion to a text-searchable document. In most cases, the document will simply pass straight through the Application Server to the PaperCut Cloud OCR Service. However, if there are connection issues, the document will be held for approximately 30 mins (default) while the Application Server retries the transmission. If it still cannot be sent, the document is moved to the failed scans folder on the Application Server. Once the document reaches the OCR Cloud Service, it is converted to a text-searchable document by the Cloud OCR Service. If it cannot be converted to a text-searchable format within the configured timeout period (default 30 mins), or if a converted file cannot be sent back to the Application Server (default retry period of 30 mins), the document is held by the PaperCut Cloud Services for 24hrs before being securely deleted. After a text-searchable document has been sent back to the PaperCut MF Application Server, the document is delivered to the scan destination. What text-searchable file types are available? Is OCR available for all scan actions? Yes, you can enable text-searchable file types for all types of scan actions. Yes, the PDF (Searchable) scan job output is PDF v1.5 with PDF/A-1B compliance according to the requirements defined by the PDF/A standard. What languages are supported by text-searchable documents? Detection of multiple languages in the same document is supported. Will the number of concurrent scan jobs affect the scan job processing time? The Google Cloud Platform is doing the heavy lifting for us. It processes concurrent jobs in parallel and handles scaling of service with a high user load. We have not seen any decrease in performance based on user load. Will the image quality of my scanned document be enhanced by despeckling, deskewing, and hole punch removal? In release 18.3, there will not be any image quality processing. Does the document orientation on the MFD matter? Yes it does. If a scan action is set to portrait, then PaperCut MF will assume the short edge of the page is the top of the page. Similarly, if the scan action is set to landscape, PaperCut MF will assume the top of the page is the long side. If a document is scanned in an unexpected orientation, such as sideways or upside down, the OCR functionality will not be able to read the text. Will the XML metadata file identify OCR scan jobs? Of course. OCR scan jobs will be identified in the XML metadata file by the file type and also a new element specifying whether or not OCR is enabled. For more information see, XML metadata file. Why am I limited to only three file types? PaperCut MF supports thousands of MFD models with varying display panel sizes and resolutions, so we need to cater for the smallest display panels. This means we are limited to being able to display a maximum of three choices at the MFD. What URL and port do the PaperCut Cloud Services use? Text-searchable documents are sent to their destination via the PaperCut MF Application Server and the PaperCut Cloud OCR Service. In most cases, the document will simply pass through the Application Server to the PaperCut Cloud OCR Service. However, if there are connection issues, the document will be held for no more than approximately 30 mins (default) while the Application Server retries the transmission, before being securely deleted. cannot be downloaded to the Application Server within the retry timeout period (default 30 mins). If this occurs, the file is securely deleted and cannot be recovered.